Once the integration steps have been completed, the administrator must create one or more shares within the Foldr Settings >> Shares to present as many SharePoint sites as required to users. 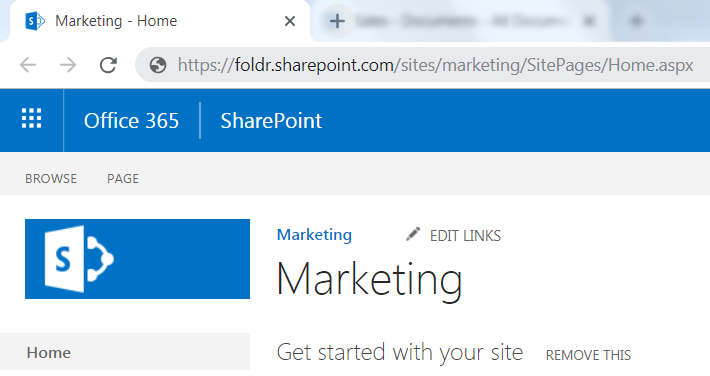 To present the default Documents folder from a SharePoint Team site called ‘Marketing’, the share path requires the full tenant address in parentheses, followed by the site name as shown below. If you are unsure of your tenant name, this can be found easily be signing into portal.office.com, launching SharePoint from the dashboard and obtaining it from the browser address bar. Important – If using automatic account linking, ensure that the Microsoft Office 365 service account is selected on the Share configuration screen in Foldr Settings. In some cases you may need to present an organisations default / root site. 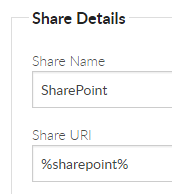 To do this simply add a new Share within Foldr Settings >> Shares using the share path %sharepoint% to present the root site of the organisations SharePoint structure. The URL for the SharePoint installation is discovered automatically through interaction with the Microsoft API.